Friday night I stopped by the Franklin Institute to check out the “Marvel: Universe of Super Heroes” sneak peek preview party. I ran into a lot of fans who were eager to be the first ones to check out the much anticipated show full of their favorite super heroes. I asked the fans which super hero they would like to be, and what super power they’d like to posses. The exhibit is full of great tidbits, props and selfie moments with your favorite superhero, over 300 objects from 80 years of comic book history . But I’m going to let you check it out in person, in my column we’re going to focus on the folks who attended. The show is from April 13th through September 2. Babette Taylor would like to be the Black panther with the super power of invisibility “I’d like to be invisible so I can go around and lightly smack dumb people in the head.” and Kevin Miller would be Wolverine with personal healing power. Danielle Lambersky would channel Ahora and Joshua Bernett you guest it – Spiderman. Joshua tells me he has other outfits with the spiderman theme, including a hoodie that has a Spiderman mask. Lena Nhek, wonder women, and invisible so I can check out Area 51, Sam Holloschutz wants to be Superman to fly, Chris Borden would be Capt America and Time Travel back to the 20s to stop WW II and Johanna Morales, Root Train (OK I hope I heard her right especially since she’s a PhillyChitChat reader), I did hear her say she wants the power to fit in small spaces. Everyone once in awhile I notice that the Franklin Institute has a fun quirky “Science after Dark” party. I got back from my trip on Monday night and was excited to see that they were having one for Fat Tuesday aka Mardi Gras the following night. The sold out event attracted many folks from around our area. I especially enjoyed capturing people who dressed for the themed night. That’s a clue, if you want to appear in any of my outlets, dress to for the theme. PS The Red Ball is coming, wear red. These folks broke the rules for me, they put their masks on. Know they you are not to wear masks inside the Franklin Institute. Don’t worry they immediately put them back on the top of their head. medical details on each crime. It was fascinated and horrifying at the same time. Ohhhh the Flower Show is coming. I love the Flower Show. I love that I get to partner with them on promoting it cause I love the flower show. It starts Saturday, March 11 and runs through March 19th. There’s lot of fun activities including their new party this year, “Flowers After Hours” on Saturday night at 9:30PM. You get to see the flower show at night, with less crowds, plus dance to the tunes with Best of Philly’s DJ Robert Drake and rocker Tommy Conwell; sip and sample spirits from Fine Wine & Good Spirits; save a Snap by creating your own life-size floral crown; and geek out over unexpected ’90s themed games with the Philadelphia Museum of Art, The Philadelphia Orchestra and The Franklin Institute. UrbanStems will pop-up with a show-stopping floral selfie-wall. The evening will be hosted by Kristen Kurtis, ’90s enthusiast and XPN morning show host. Plus there’s a costume party, and you know how I feel about that. Yum frozen marshmallows. I tried them too. They have a new sports exhibit, which is really cool and interactive. Kids and adults will really love it. See you Sunday for more PhillyGossip. about exciting events happening in our area. 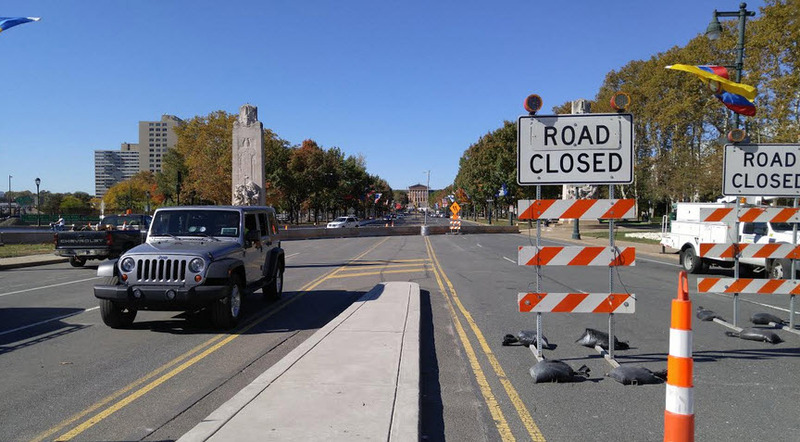 King of Prussia, PA – A traffic pattern change with accompanying lane restrictions will start Friday morning, October 23, on the Benjamin Franklin Parkway between 21st Street and 20th Street in Philadelphia for the replacement of the bridge carrying 20th Street and the Parkway over Interstate 676, the Pennsylvania Department of Transportation said today. Street/Parkway bridge in three construction stages through July 2017. 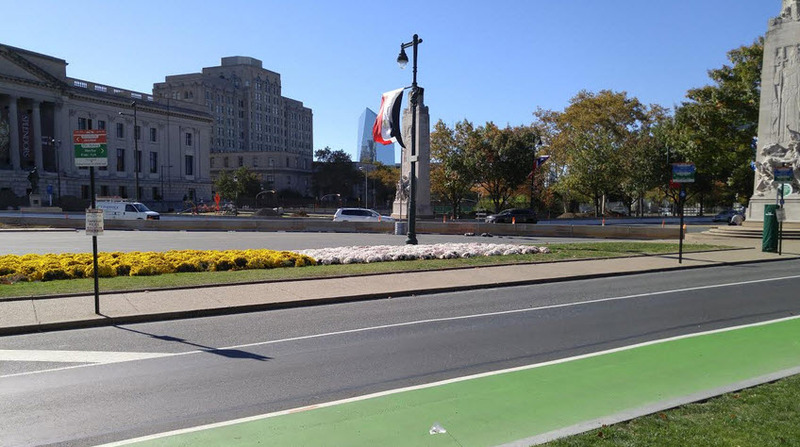 2016, will reduce the Parkway’s eastbound inner lanes from three lanes to two approaching 21st Street, and shift the two eastbound through lanes to the right onto temporary pavement to merge with Winter Street approaching the 20th Street intersection. Three eastbound lanes will continue across 20th Street onto Logan Circle. 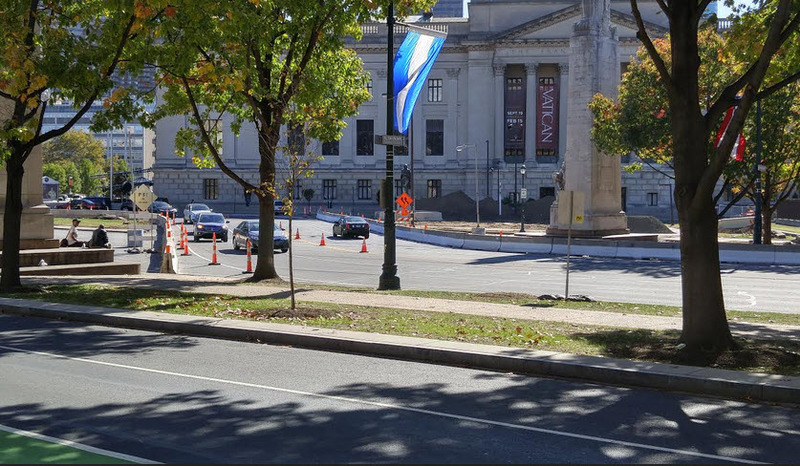 Westbound traffic will have two lanes coming from Logan Circle onto the Parkway at 20th Street. 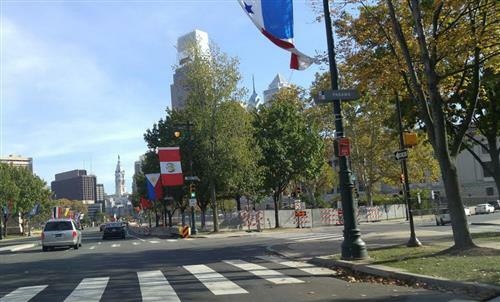 Motorists will follow the temporary construction traffic pattern to return to the Parkway’s westbound inner lanes where a third lane returns at 21st Street. The Parkway’s westbound outer lanes will remain open and unchanged. The speed limit on the Parkway through the temporary construction traffic pattern will be 15 miles per hour. The road is closed in both directions on Parkway at 20th on the westbound side of the street for a block. The bridge is under this section and will be updated. In addition, motorists traveling north on 20th Street will experience a slight shift in the travel lanes when driving through the intersection with the Parkway. The schedule for implementing the temporary construction traffic pattern is weather dependent. 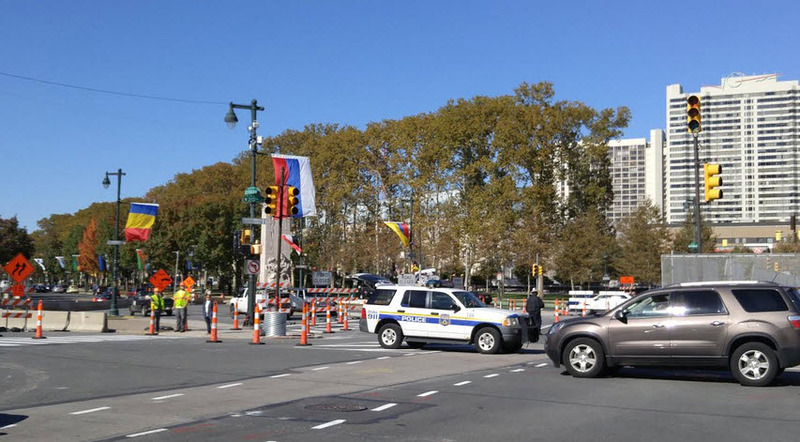 The Parkway’s eastbound outer lanes remain closed at 21st Street. Motorists continue to be detoured over 21st Street and Winter Street. 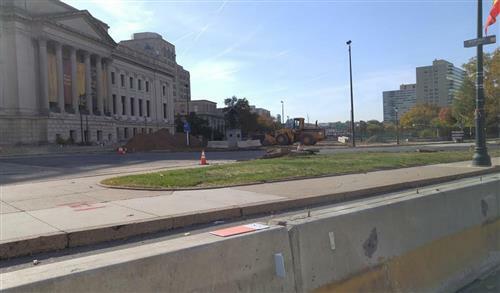 The bridges carrying 20th Street/Parkway, 19th Street, and pedestrian walkways at the Free Library and former Family Court building are the first four of seven structures to be replaced under this project. PennDOT also will replace the deteriorating bridges carrying 22nd Street, 21st Street, and 18th Street. Click above for video. Soon I will update my site and the videos will work here. yeah! 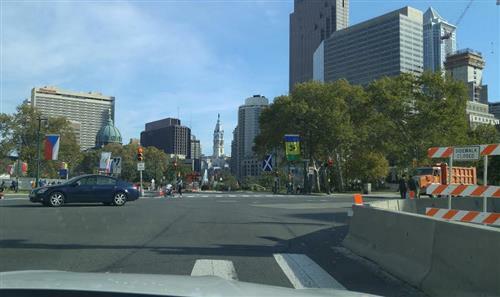 The seven bridges over I-676 are being replaced in two major stages to minimize traffic impacts. The entire project is scheduled to finish in fall 2019.